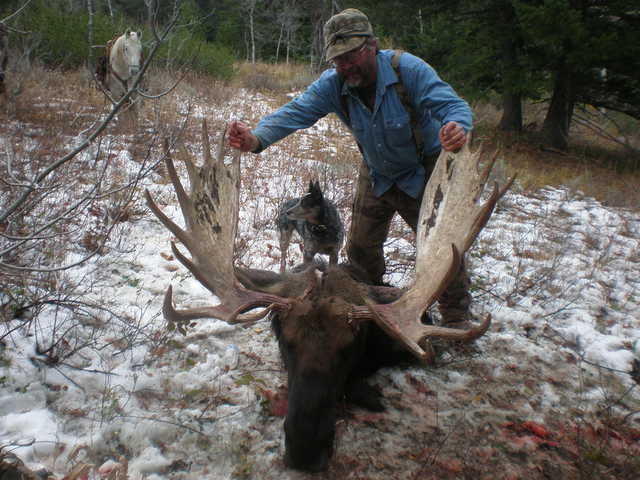 Brandy likes to say that I am bragging but did you not see the size of this guy he is worth bragging about. This was for me, mentally a really tough hunt. I was super excited the day I checked online and found out that I had drawn and then again was like OH CRAP, now I actually have to hunt. I am not an avid hunter believe it or not, growing up with my dad an avid hunter, professional guide (he loved it so much he bought the business hence the blog). 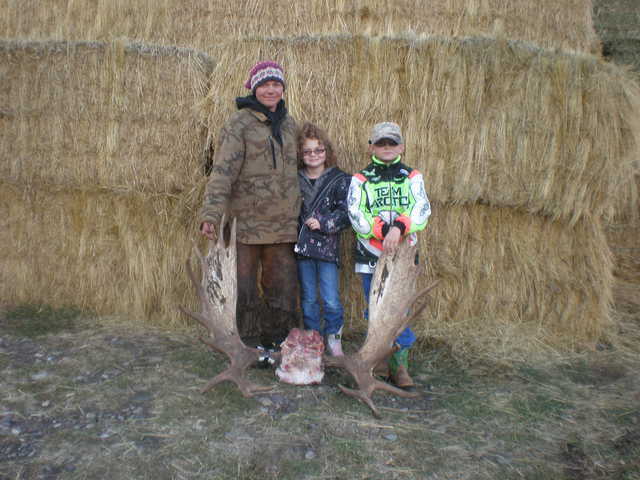 Any who back on track, he had all three of us girls hunting as soon as we were old enough (12 in the state of Idaho) not that we were not hunting with him before that but legal to shoot our own. I drew my first cow tag in the fall after I turned 12, I don't remember much about it just that we rode around and around and around and then finally we came upon the elk and of course we got our elk but the whole experience was just not for me. I didn't hunt again until well 2010! 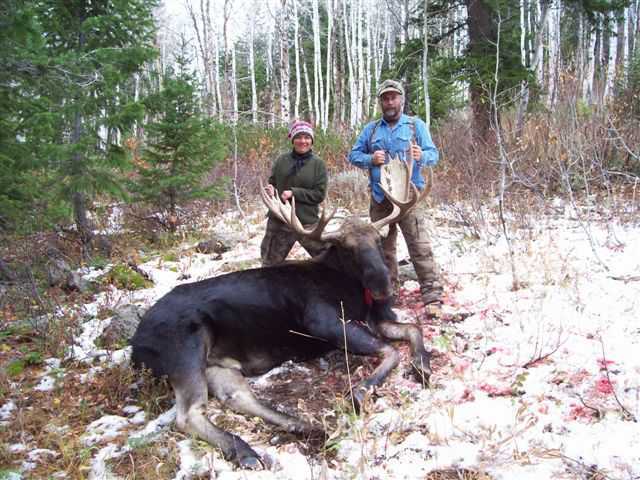 I have always wanted a moose though, I think they are an amazing animal! Every year in April George aka dad would call me and remind me that it was time to put in for a moose tag and every April I would put in. I tried the beginning of April, the middle of April and even the last day in April for 15 yes 15 years! In May I would start checking for draw results and usually I would see the same response "sorry this license number has not drawn" So I would make the call to dad not again this year. I would check stats of how many people put in and etc. there was on year only 29 put in for 15 tags, I didn't draw that year! I had a 50/50 chance and still nada! I was beginning to think either the Fish and Game had it out for me or I wasn't meant to get a moose, but as the picture shows I did finally get my tag! I can honestly say I didn't hunt really hard for this guy, one of the advantages to being a outfitters daughter tell all the clients what you are looking for and they will all be scouting for you! 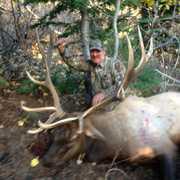 I hunted a whole 4 days one of those with one of my dad's best clients in the world!! Wayne and I sat on Chewy's Rock all day, he even let me take a nap! We didn't see anything but other clients and a few clouds in the sky! The kill day as I will call it started out like any other day in a hunting camp for me, wake up really early start coffee and breakfast wait for everyone to get out of bed, feed them, make their lunch for the day, and send them out but today I was going with them and I was ready! Well not really it was cold and just barely daylight but I pulled through we rode around the ridge to go sit at sheep camp and glass and wait and wait and wait somemore on a side note they built me a fire to sit by so I wouldn't freeze. Finally we think we spotted something George thinks it is a log, Jared isn't convinced we glass and wait some more, It is a big log! George goes to get more firewood Jared and I watch the "log" what the log moved! I yell at George tell him come look the log moved! He looks and by golly if that is a moose it is a big moose. We decide lets go ride across the canyon and see if we can get a better look at him. It is a 45 minute ride and on a nasty trail but we get over there and criss cross the mountain until we come upon him and two cows my dad is telling me get off your horse grab your gun. I do exactly what he says and start walking towards him and I am shaking and turn around and my dad gives me a thumbs up like he's a shooter. This is when it gets a fuzzy and I can't concentrate on anything next thing I know we are trying to get me a rest for my gun so I can try and get a shot on him I get two shots nothing he heads down the hill with one cow still with him he stops again I try again. I can't see anything through the scope I am shaking can't get shells into the rifle lets face it I am a mess! I get a couple more shots. I am sure I didn't hit him but I look and he is down, I turn to my dad and am in shock! I start walking over to the moose and then I see him turn the other way. Jared and my dad go gather the horses, I sit down and cry. My hunting career is over but I will never forget this day! My moose made the book he scored 163-6/8. He will live forever in my living room! This has to be my favorite picture! It took everything I had to hold him upright for this picture. I think my dad is smiling a little! 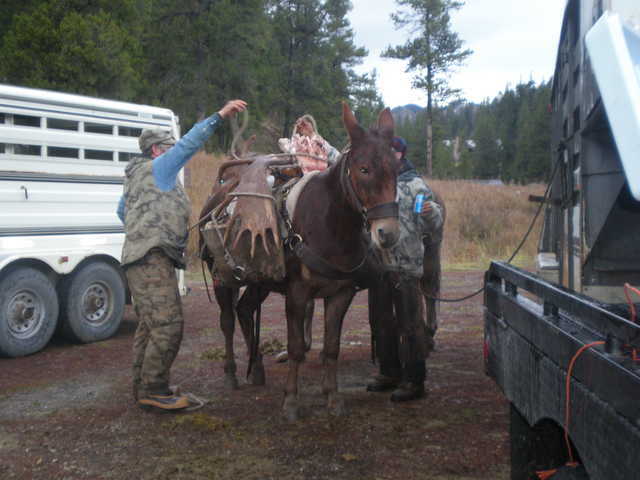 Took two mules to bring him out. He fit perfectly over the top of the pack. 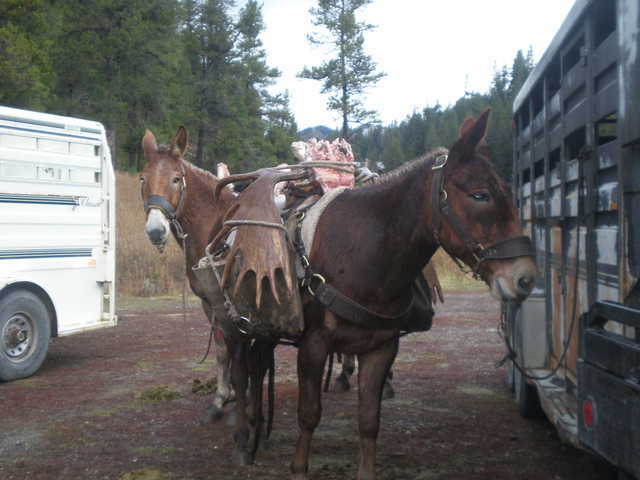 Lenny is such a good mule. I wish we had 6 more of him. Even my kids were excited! Very nice Moose. Good story. Go Again! Why is your hunting career over?